Québec, November 16, 2017 – Village Monde and the Air Canada Foundation are pleased to announce the winner of the “My Favorite Village 2017” contest at their Exploring a World of Sustainable Destinations campaign wrap-up event. 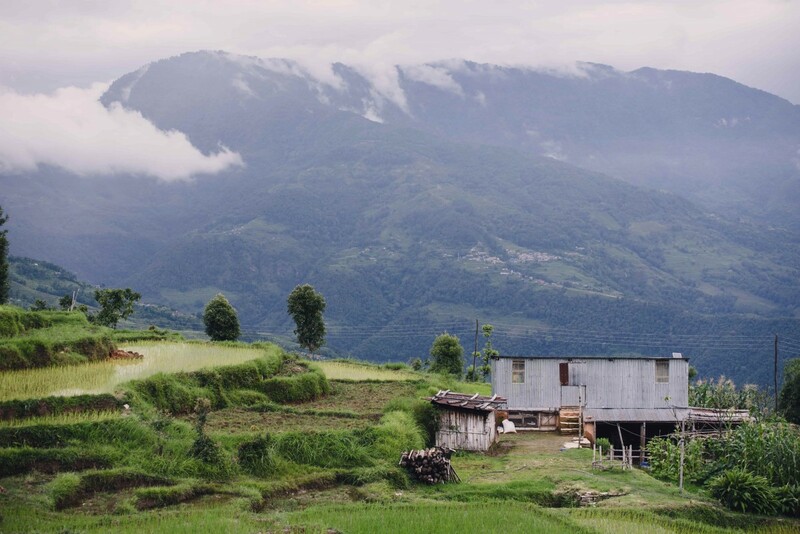 Astam, a small village in the Annapurna region of Nepal, won this prestigious award for its Annapurna Eco-Village, an exemplary initiative in the sustainable and volunteer tourism sector. Astam, with its Annapurna Eco-Village, won the award following a public vote and a huge promotional campaign on social networks. From Central America to Asia via Africa and South America, 10 dream destinations were in the running. The 10 My Favorite Village finalists were selected for positive impact in their community and for their warm, authentic welcome. In the farming village of Astam, the Annapurna Eco-Village welcomes travellers in beautiful rooms located in an immense garden. This volunteer initiative contributes to decentralizing tourism revenue generated in Pokhara, the nearby tourism capital of Nepal, allowing several families from this rural community to earn additional income and improve their quality of life. The accommodations offer an incredible view of Himalayan summits and may be the starting point for many treks. It is a true place of retreat. To promote its candidacy to the public and on social networks, every village on the shortlist received help from an ambassador. Carl Poliquin, Annapurna Eco-Village ambassador, used an effective digital campaign that won him the My Favorite Village award. “I was already familiar with Village Monde and I am proud to have supported their cause through this experience,” he explained. His efforts won him a trip for two to Nepal to live the experience offered by the Annapurna Eco-Village, a Village Monde-certified accommodation. Tourism is a growing activity in all regions of the world. It can reach the most remote communities and be used as an effective development tool. Similarly, travellers are increasingly aware of its potential impact. While it is still a leisure activity, tourism can support inclusive, sustainable growth and contribute to improving living conditions in marginalized communities, protecting the environment, and conserving heritage. Choosing the My Favorite Village was part of the Exploring a World of Sustainable Destinations campaign to promote public involvement in the travelling citizens’ movement. Promoting responsible tourism initiatives was meant to be a way of showing that sustainable tourism is within everyone’s reach but especially an enriching and rewarding experience. “The Air Canada Foundation is pleased to have teamed up with Village Monde for a major campaign in this International Year of Sustainable Tourism for Development. We are pleased to have contributed to the development of sustainable tourism around the world, and especially to have provided support to children and their families consistent with the Foundation’s primary mission, to help children in need,” explains Priscille LeBlanc, Chair of the Air Canada Foundation. To successfully complete this campaign, Village Monde benefited from the support of several partners: the Air Canada Foundation, LOJIQ, the Centre for International Studies and Cooperation (CECI), the Caisse populaire Desjardins Charlesbourg, the Charlesbourg Rotary Club, the Association pour le tourisme équitable et solidaire (ATES), and Accueil Paysan. Village Monde is a Quebec philanthropic organization of social innovation that works internationally and was founded by Charles Mony, a successful entrepreneur. Village Monde promotes the development of a sustainable tourism network that produces wealth and contributes to improving living conditions in remote and marginalized communities. Village Monde is about more than just travel. A voyage at the heart of humanity and of authenticity for discovering the world in a new way. A voyage with as much of a positive impact for communities as for travellers. 1) In Astam, Nepal, Annapurna Eco-Village is perched at the top of a hill 1600 metres high in the Annapurnas, at the heart of the highest mountains in the world. 2) The self-sufficient village of Kok Phoung Tai, in Laos, welcomes travellers to the Captain Hook Homestay, a family coffee plantation in the Bolaven Plateau in southern Laos. 3) In Pong Noi, Thailand, Chai Lai Sisters is an initiative managed by women of the Karen ethnic minority, whose bamboo huts can be used for profound relaxation in the heart of the jungle. 4) In the Esteli region of Nicaragua, La Garnacha is a place of immersion that hides an incredible artistic treasure right in the heart of the jungle. 5) The village of Dekpo, in Togo, offers a traditional and authentic rural welcome in a magnificent setting on the edge of Lake Togo. 6) In San Juan La Laguna, Guatemala, travellers will have a memorable stay at the Eco Hotel Mayachik thanks to its food, its colours, its Mayan culture, its people, and its incredible natural landscapes surrounded by belts of volcanoes. 7) In the village of Misahualli Port, in Ecuador, Sinchi Warmi Amazon Lodge is a Quechua women multigenerational project that fosters empowerment and promotes local culture. 8) In the fishing village of Toubab Dialaw, in Senegal, Sobo Bade, an oceanfront accommodation, is managed by friendly people who encourage sharing and exchanges with visitors. 9) In Zanskar, India, Tangso Rural Homestays, reachable only after a long journey—a trek of a few days in the heart of magnificent Himalayan summits—offers a total change of scenery and a total getaway. 10) In Tizi N’Oucheg, Morocco, the Hostel Tizi N’Oucheg uses tourism-generated revenue to improve village infrastructure such as the piped-in water system that was installed a few years ago.